Titan is a fantastic theme, now available on WordPress.com. It’s a highly readable, clean theme, with lots of options: four widget areas, a customizable header, and more. 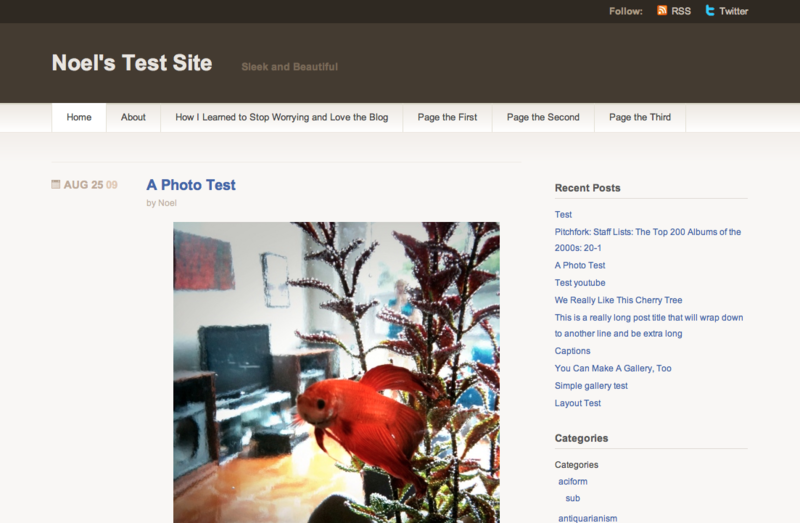 An enticing color scheme and loads of customization make Titan a wonderful theme for your blog. To start things off the header has some nice social networking and RSS links, making it easy for users to keep up with your blog. Right below the title is a highly customizable header. There are options to turn on and off categories and pages, allowing you to choose how users navigate your blog. Aiding in even more customization are four widget areas, including a nice footer widget area. This looks interesting. I’m lovin the customization options and the social links. That helps keep things organized. Thanks. This theme looks good. I like the RSS and Twitter links in the header and the hide home page option (wish more themes had this). I just changed my theme recently, but will certainly give Titan a try very soon. It’s nice but I just wish the writing (blogging area) was wider. Lot of wasted space. This is a sweet theme! yay! new theme! i’ll try this one right away! Looks cool. The twitter button at the top and the widget on the side and bottom are very nice. Can you please have another filter/tab called “recently released” themes? I am tryingto find Titan, but I just cant! Wonderful theme. Love it and activated it immediately. Can’t find the customizable header option though at the moment, but maybe I’m just blind. Sadly not with a white background. If I could get this one with a white BG, it was my choice. Is a “header” missing? I tried to activate it but was told no header. ??? Oh good it happens to everyone…There’s a typo under the photo “a wonderful theme for you (sic) blog”…that’s the kind of stuff I send out all the time and then have to fix it but the unfixed version lives on and on and on! This is why I don’t like instant publishing to ALL the places that I want to publish my blog… I know- Use the spell check system! Use the awesome grammar checker! sigh. sometimes I just don’t see it. No worries, I’ll still check out Titan…thanks for another good thing. Changed to this theme immediately. Very stylish! Excellent…. I should try this with my photoblog and see how it will looks. I like the simple design and outlook with header customization. this is exactly what i’ve been looking for!! thanks!!! fantastic theme, it has everything I need, it’s clean and has nice colors. thank you Automattic! Clean and crisp…I’ll give it a try. Congrats again! Looks great, when are you going to enhance the other .com themes? just changed my theme to this one. so far I really like it. I like that there is a twitter button at the top. Might have to give it testing sometime. Looks good with lots of options…thats what we like. I like it a lot. It would be a wrench to have to change my current theme when I’ve only just settled into the colours and the new header, but I could be persuaded to stray….. Damn! That goldfish is levitating! Great blog! Very nice theme! So far my Inove works good, but I would think of switching to Titan if only it had an option to prepare a custom header or at least a header banner. I would be extremely grateful if you would think of releasing more themes with dropdown menus (so far: inove, monochrome and titan) and custom headers/banners available together. Gaudeamus WordPress habemus. What a beautifully minimalistic addition to the roster of WordPress themes! It has most of what I look for in a theme and above that, the text is highly legible! Just a question: Would it be possible eliminate the footer widget area entirely by not putting any widgets on it, or would it still show up while viewing? I like the idea of a footer area for widgets. Makes it more “web page” like. For a “highly customizable header” I was hoping to be able to use custom headers and changing colors. Other than that, this theme is perfect, even better than Motion for my own tastes. Only the lack of custom header prevents me from using it. Nice… I may give it a shot… Thank you..
Nice! The more the themes the better. can u get one that has the drop-downs like this one does, a custom header, a header widget area, a footer widget area, and two widget columns at the right side. this would be perfect for my blog but it doesn’t exist. i like titan btw. keep them coming! That fish is named Titan too, isn’t it. Speaking of which, maybe I’ll go for sushi tomorrow. Calming and beautiful. I love it. Very nice indeed. Will try to find a time to test it out. Using the footer area for widgets is the ‘new’ thing, so it’s great to see WP keeping up on making sure our theme choices are current. Thanks for staying on top of things! It’s great to have choices! love the photo of your freind wanda! congratulations! you must be feeling very proud of yourself – hat to think how long it took you to put together! Cool! I like the color scheme and the customization. Neat!! Will mos def check this out when I am ready to change my theme. wow, loving it! very tempting but vigilance is working GREAT for me right now! Really nice template! May have to switch it up! Love your work, Noel! This one looks great. Clean and functional. This is a very good theme, and looks very good with my blog. Lets see first if all the existing posts can be adjusted with the width of the theme. Nice theme. Hope there was an option to change the brown color. A suggestion is due here. It would ultimately be important to revise and improve already-installed themes at some point in time. There are possibly many reasons why a blogger may not want to change a theme but wouldn’t mind improving it to match with the updated development and features. This theme is lovely! Having lots of fun with it. Look neat! will definitely use for a future project. Thanks again W.P. I’ll skip it. Looks like something from 2003. That blue and brown just don’t look right there. Wow! Sounds all sorts of amazing! hi five here in Bandung ! that is a must try theme! thanks! Looks great, I’m still deciding which theme to use. I love this theme and switched immediately. However, I agree with one of the above commenters: Is it possible to eliminate the footer, or just to take the links and the pages out as I (and my readers) are used to having everything in the sidebar. Thank you! i like this, it’s so good. Love this!! I’m already using Drew’s other Vigilance design.